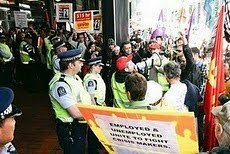 Just like in 1991, New Zealand's governing National Party is attacking both the waged and unwaged wings of the working class at the same time. 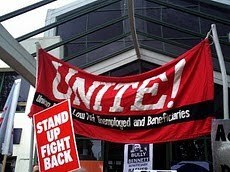 The Aotearoa Workers Solidarity Movement interviewed Paul Blair of the Rotorua Welfare Action Group about their response to National’s assault on beneficiaries (for example, by cutting emergency benefits and forcing many sickness and domestic purposes beneficiaries to work). 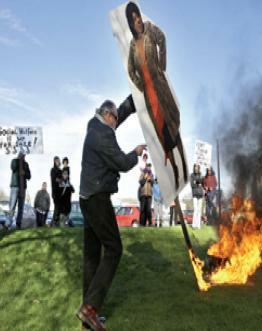 They held an incendiary protest on July 12 in Rotorua. What is your personal and political background? Working class Catholic grew up in Canterbury/Bankstown area of Sydney Australia. 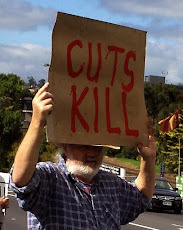 My father was a member of the Australian communist party in the early fifties when it was banned by the State. Came to NZ in 1969 basically to dodge the draft into the Vietnam war and then ended up staying. Worked as a truck driver, labourer, and in low paid jobs. Learnt lessons of unionism as a unionised driver with the Coca Cola company in Sydney in the sixties. 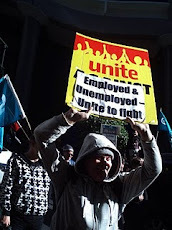 Benefited from free University education in Auckland in the seventies, turned on by Marxist thought, and worked as a teacher and later graduated in law from Waikato Uni and admitted to the bar in 2009. Went on first political march in 1976 against attacks on DPB’s. Politicised by the 1981 Springbok tour and lost all respect for “Law” and “State”. I describe myself as a left socialist-anarchist-atheist. 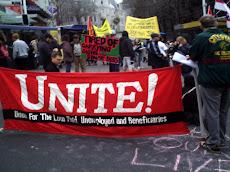 Can you give some specifics about the recent beneficiaries demonstration in Rotorua? The rally/demonstration theme was chosen so that if only a handful turned out the demonstration could still go ahead without losing credibility. On the other hand if a good crowd turns up we could march on the road. 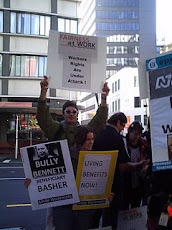 As it turned out we had about a hundred people (see photos) turn out so we marched around to the National Party Offices with our demands. A good turn out for Rotorua in the middle of winter.